CHISINAU, Moldova – It was my first Saturday night in Moldova and already I was starting to feel a bit homesick. I needed something to remind me of home. The U.S. Embassy had given me a welcome packet when I arrived, which included a list of recommended restaurants. A place on the list called “Cactus Saloon” caught my eye. “Mexican food, Moldovan style,” the description read. It was in the low 20s outside and the icy sidewalks and dimly lit streets made the 20-minute walk to 41 Armeneasca St. a bit dicey. But I wanted a taste of home – preferably in the form of chips and salsa followed by a bean burrito or chicken fajitas. I arrived at the Cactus Saloon and immediately was impressed by two things. The place was packed, always a good sign. I grabbed the last empty table. And the decor truly looked like a Mexican restaurant, with pictures of the Old West and Mexico and even one of those swinging saloon-doors. A mariachi band wouldn’t have seemed out of place. Eastern European cuisine is notoriously bland but I had high hopes. Did the Serrano family have a distant cousin living in Chisinau? My waiter, Nicolai, brought me a menu. Every dish was listed in three languages – Romanian (the dominant language in Moldova), Russian and English. But it might as well have been in Greek, because nothing looked remotely familiar to me, with the exception of Corona beer (priced three times higher than the local beer). No tacos, tostados or tortillas. They had all sorts of chicken, meat and fish dishes, even soy meat, but all prepared in ways that seemed to be anything but Mexican. I called Nicolai over to the table. “Excuse me,” I said. “Do you have anything spicy?” He mentioned some sort of “balsamic” sauce they had prepared and a dish involving chicken and almonds. I knew that wouldn’t satisfy my craving. “Don’t you even have any salsa?” I asked. Nicolai gave me a blank look. It was clear he didn’t understand. “Salsa,” I repeated more loudly, thinking he hadn’t heard me over the music blaring from the restaurant’s sound system. 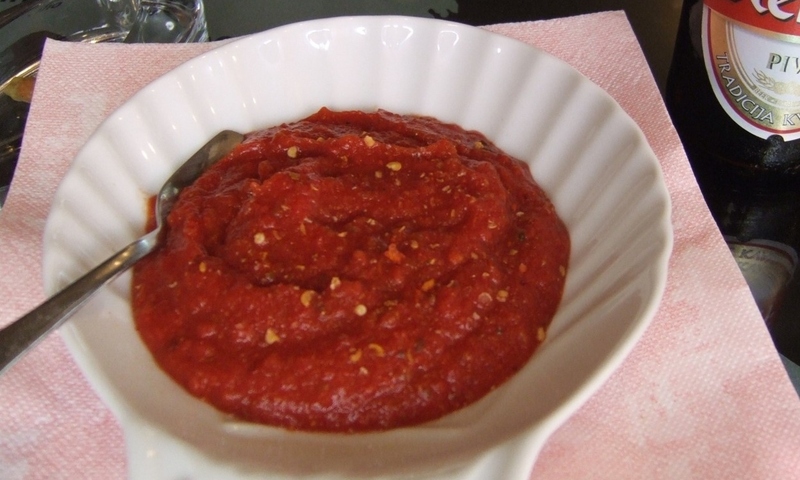 While I waited for him to return, I remembered the time I had asked for salsa at a “Mexican” restaurant in Latvia, another country in Eastern Europe. They ended up bringing me a bowl of ketchup with pepper poured on top of it. Maybe I should have just kept my mouth shut. “I am sorry,” Nicolai said after returning from the back. 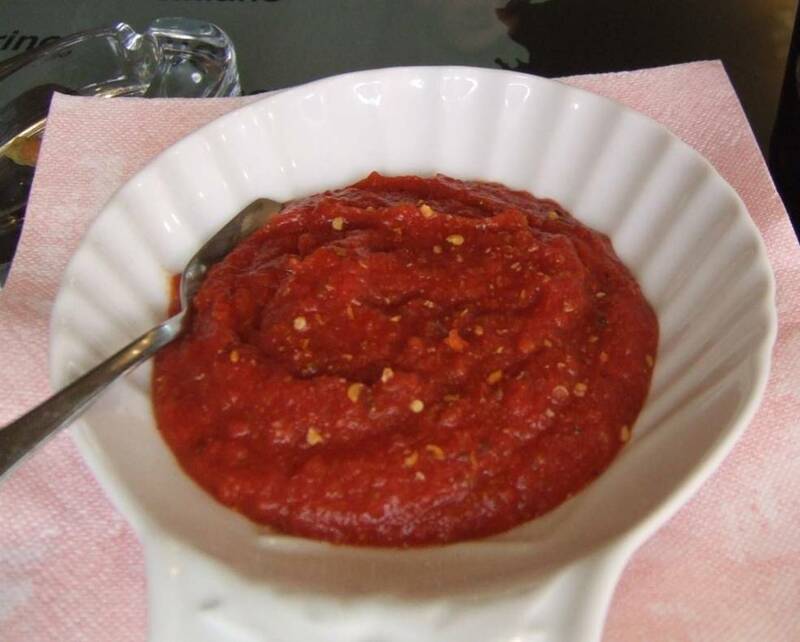 “No salsa. We only play rock ‘n roll and maybe a little jazz.” There would be no salsa for me this night. As it turned out, though, the meal was quite good. I had chicken in some sort of mystery sauce with potatoes and a roll on the side. It just wasn’t what I had expected. That’s the key to enjoying a Moldovan dining experience. Leave your pre-conceived expectations at the door, because you never quite know what you’re going to get. You do know it’s going to be different than back home, and that’s part of the fun. My very first day in Moldova, still jetlagged from the 24-hour journey, I ordered something that I thought would be harmless comfort food – a vegetarian pizza. Then they brought it out. It was drenched in mayonnaise. 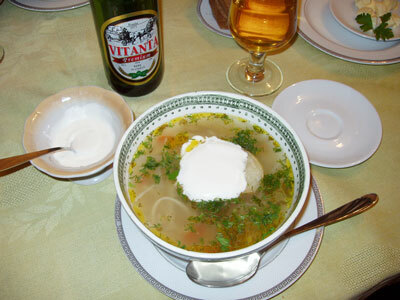 Indeed, Moldovans, like most other Eastern Europeans, love cream sauces, cheese, mayonnaise and other dairy products. Order a bowl of soup, and chances are it will come with a big glob of cream floating at the top. Cardiologists here never have to worry about running out of patients. But I’ve had some meals that were wonderful. And you can’t beat the prices. Most meals out cost between $5 and $10, and that includes a glass of Moldovan wine, which is quite good. When I truly long for the taste of home, there’s always McDonald’s. Chisinau has three of them. A Big Mac is a Big Mac, wherever you go. As for my quest for salsa, I finally found it. Believe it or not, Chisinau actually has two Mexican restaurants. The second one I visited – called “El Paso” – was much more authentic. They even brought chips and salsa to my table as I was seated. I’ve also learned to be more careful when I order. From now on, I specify “no cream” when ordering soup. At a pizza place, I ask for pepperoni and black olives. And please, hold the mayo. Supermarkets are largely an American and Western European phenomenon. In much of the world, a majority of locals shop for their groceries in huge outdoor markets, like this one in Chisinau, Moldova, called the Piaţa Centrală. If you want to learn more about a country and its culture, visit one of these outdoor markets. They always seem to be jammed with people picking up fresh ingredients to prepare their meals for the day. Besides food, you can find almost anything imaginable here – batteries, underwear, watches, bootleg DVDs, bed linens, and some items you likely won’t be able to identify. It’s sort of like a third-world version of Wal-Mart — without the greeters, muzac or climate control. Finding the fish stalls is easy. Just take a whiff and follow the scent. 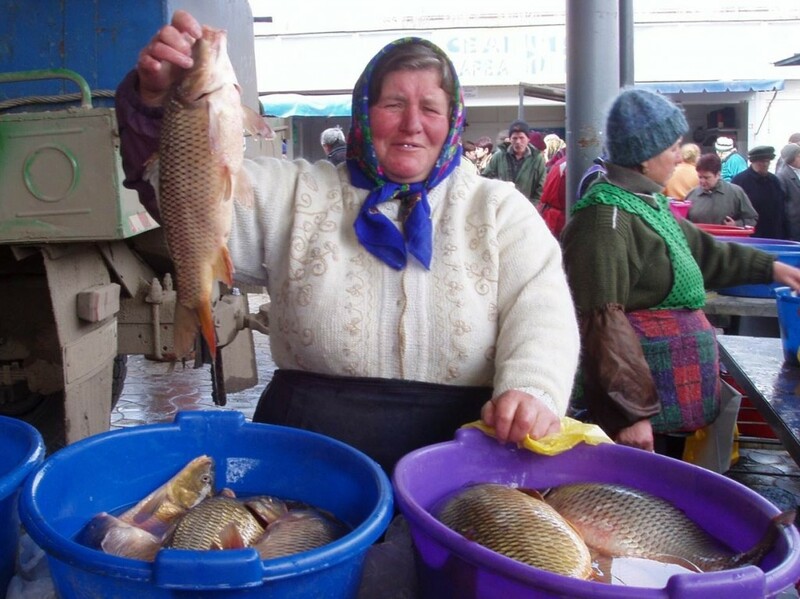 This Moldovan – sporting a silver-capped tooth and babushka – didn’t need much coaxing to proudly display her merchandise. Despite the seller’s enthusiasm, I wasn’t a buyer that day. We tended to shop at more conventional stores, where the fish was kept in refrigerated glass-covered cases instead of buckets full of water. Yes, the food in supermarkets may be more sanitary. But in terms of atmosphere – and photo opportunities — outdoor markets offer much more local flavor. CHISINAU, Moldova – It’s 7,000 miles and nine time zones between Phoenix and Chisinau, Moldova. It actually feels like it’s much farther than that. Through the blowing snow outside the living room window of my second-floor apartment on Nicolae Iorga Street, I can see a statue of Vladimir Lenin in the courtyard of Moldova’s Communist Party headquarters. It isn’t a monument to a bygone era. Moldova, which endured a half-century of totalitarian rule as part of the Soviet Union until it emerged as the independent Republic of Moldova in 1991, has returned to its communist past. Its people elected a slate of communist leaders in 2001 and re-elected them last year. 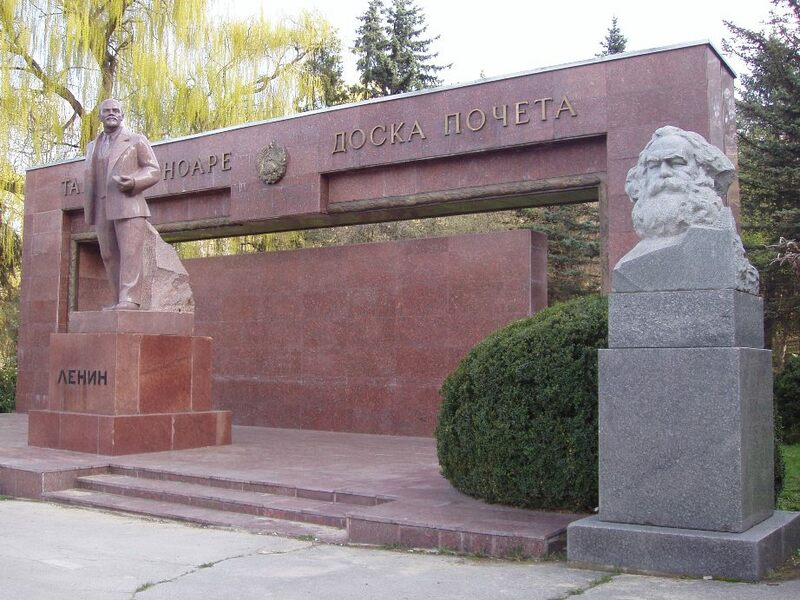 But Moldova’s version of communism would make the real Lenin spin in his grave. Communism here is much less ideological than the past and much more user-friendly. There are no forced labor camps, no KGB, and no bread lines. There are, however, free elections, a free-market economy, and the country is moving toward European integration. Moldova also enjoys solid relations with the United States. Heather Hodges, the U.S. ambassador to Moldova, calls the relationship “positive and productive.” Moldova is even part of the U.S.-led coalition in Iraq, having sent 65 troops there since 2003. 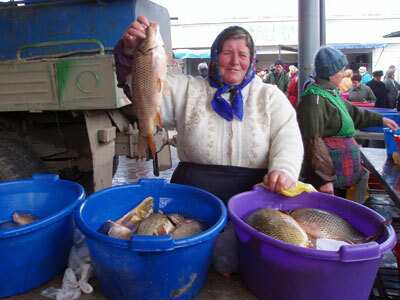 Landlocked between Ukraine and Romania, Moldova has a population of about 4 million people. Like many countries in this part of the world, it’s been batted back-and-forth between invading powers over the centuries and has struggled to maintain its cultural identity. Moldovan is the country’s official language, but is as similar to Romanian as American English is to British English. 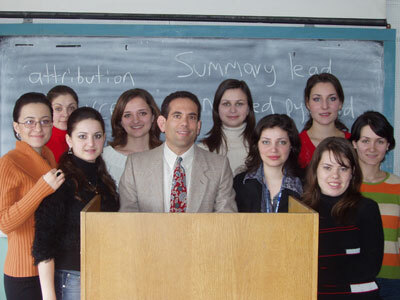 Most Moldovans also speak Russian and it’s not uncommon for young people to speak at least a little English, which is widely taught in the schools. Moldova’s economy, which was highly dependent on the rest of the Soviet Union for energy and raw materials, took a huge hit when the USSR disintegrated 15 years ago and has yet to fully recover. Today, it’s the poorest country in Europe, with an average salary of less than $100 a month. Many people need to hold down two or more jobs just to make ends meet. Because wages are so low, an estimated one million Moldovans – mostly young people — have left the country in recent years to find work in other European countries. A Moldovan engineer or college professor can increase his or her salary tenfold by working as a construction worker in Portugal or housekeeper in Italy. This exodus is part of the reason the communists have returned to power. Ghenadie Slobodeniuc, my landlord’s a 28-year-old son who is a lecturer in international relations at Moldova State University, tells me that the communists garner much of their support from older Moldovans who’ve remained in the country, turn out at the polls, and fondly recall the days when bread was cheap – even though you had to stand in line to get it — and everyone was guaranteed a job. He adds that more centrist parties, which held power in the years after independence, failed to keep their promises and were rife with corruption. So the communists seemed like a palatable alternative to a majority of the Moldovan electorate. But as Ambassador Hodges notes, corruption remains “endemic and affects all aspects of Moldovan life.” And Slobodeniuc and other Moldovans with whom I’ve spoken are skeptical that government — in any shape or form — can significantly improve things. I am living in Chisinau (pronounced kish-i-now), the capital and largest city, with a population of about 700,000. For such a poor country, I’m amazed at how many Mercedes and BMWs I’ve seen and some of the high-end boutiques here wouldn’t look out-of-place in Scottsdale. Like a lot of other developing countries, there’s a huge gap between the rich and poor. During my second week here, a record cold spell hit Eastern Europe and temperatures in Moldova plunged to 10 degrees below zero, the coldest weather in more than a decade. Fortunately, the apartment the U.S. Embassy arranged for me has dependable heating and hot water. It’s something we take for granted back home, but here in Moldova, it’s considered a luxury that a good segment of the population can’t afford, particularly those in rural areas. I’m just a five-minute walk from the university at which I’m teaching and plenty of stores and nice restaurants are close by. Street crime is lower than in many American cities. The biggest danger for me has been navigating the sidewalks. Most of them haven’t been cleared of snow and are treacherously slippery. And I’ve been warned not to walk down side streets after dark because of the prevalence of open manholes. It seems the covers sometimes get stolen and sold for scrap metal. While Moldova isn’t known as a tourist destination, there are some interesting things to see here – ancient monasteries and some of the best wineries in Eastern Europe. I look forward to exploring the country. But for this Arizonan, it’s a bit too cold now to do much sightseeing and venture far from my apartment. For now, at least, I’ll have to be content with my reliable radiator and view of Lenin. Smile and say … jeeeeez, it’s cold! Every part of the world has its own unique customs. In Eastern Europe, it’s traditional for newlyweds to have their post-wedding photos taken in front of a statue of special significance. 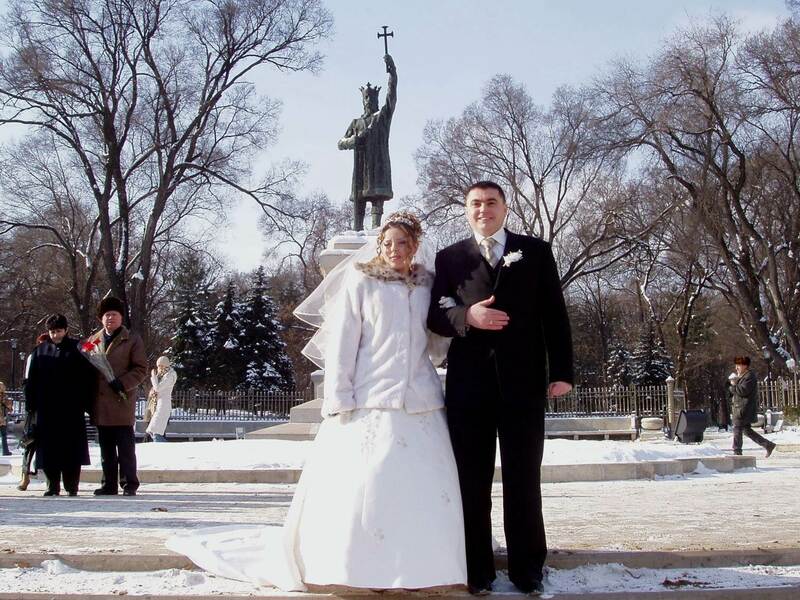 In this case, a Moldovan couple is posing on a cold January day in Chisinau under the watchful gaze of Stefan cel Mare (Stephen the Great), Moldova’s national hero. The history is a bit complicated but basically, if it weren’t for Stefan, what was then known as Moldavia would likely have been swallowed up by the Ottoman Empire in the late 15th century. My apartment was a short walk from this statue and on weekends – even on bitterly cold days like this — I would venture out to watch the steady stream of newlyweds have their pictures taken. They would arrive directly from the church in limos, pop out for a quick photo, and then drive off to meet family and friends at a reception. On some days, there were so many weddings, it was like watching an assembly line. I hope the bride and groom didn’t mind that I snapped their picture while their own photographer was setting up. I imagine they were much more concerned about getting out of the cold and beginning their new life together. CHISINAU, Moldova – Spring officially arrived on March 1 with the beginning of a 10-day festival called Martisor. 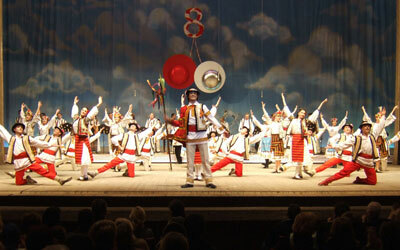 It’s a tradition dating hundreds of years in which Moldovans celebrate the rebirth of life after a hard winter. There were several inches of snow on the ground and it sure didn’t feel like spring. But my students at Moldova State University helped get me into the spirit of the coming season. As I entered the classroom, they lined up to pin special Martisor ornaments onto my sweater. These beautiful pins, made of red and white thread and shaped into flowers, are a Moldovan symbol of friendship and respect. and dancing by performers wearing colorful traditional costumes. The best seat in the house cost less than $8 and it was as entertaining a show as anything I’ve ever seen at Gammage. Perhaps the most enjoyable aspect of living abroad is getting the chance to become engrossed in another culture and thoroughly learn about a part of the world so different from Arizona in so many ways. Moldova is a poor country, yet Moldovans are some of the most generous and welcoming people I have encountered. Each day when I arrive at the university, I am met at the school of journalism office with a warm greeting of buna ziua (good day) and a cup of hot tea. Despite being warned that the students would sit in class stone-faced and silent – a common stereotype of Eastern Europeans – I am finding them to be energetic, responsive and participative. Class discussions are as lively as back home. My courses are conducted in English, which is a bit of a struggle for some of the students, but everyone is able to speak the language well enough to get by. I’m not exactly sure why, but journalism students in most Eastern European countries tend to be overwhelmingly female, and that’s also the case in Moldova. In fact, all of my students in both classes I’m teaching are female. Many of them are working as journalists at major media outlets in the country. Moldova, which has been an independent country for 15 years, is still building a free press and there are opportunities for young people to enter the field and get meaningful on-the-job experience while still completing their studies. Only one of my students has been to the United States and most of them have had very little direct contact with Americans. I try to allot a few minutes at the end of each class for general questions about America. They are teaching me Romanian words and about their country’s history and customs, including Martisor. I think I am learning as much from them as they are from me. According to Martisor tradition, you’re supposed to wear the pins until the trees bloom, at which time you hang them on a branch for good luck. But I’m going to break with tradition and keep my Martisor pins. They are a special memento of my students and spring in Moldova. Transnistria – I’m back in the U.S.S.R! TIRASPOL, Transnistria – Greetings from the self-declared Republic of Transnistria, one of the most bizarre places on Earth. 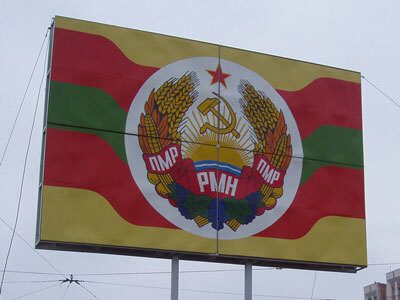 Transnistria has its own government, army, flag and currency and controls its own borders. In short, it thinks it’s a country. The trouble is, no one else does. This renegade region, the size of Rhode Island and home to about 600,000 people, is 50 miles east of where I am living in Moldova’s capital of Chisinau. Technically, Transnistria is within the internationally recognized borders of Moldova. But when Moldova became an independent country 15 years ago, this mostly Russian-speaking enclave decided to go its own way. A civil war erupted, in which 1,500 people died. Since then, Transnistria has run its own affairs under the authoritarian regime of “President” Igor Smirnov. About 1,800 Russian troops help keep him in power. No country in the world recognizes Smirnov’s government and Transnistria has become known as a haven for weapons and contraband smuggling. 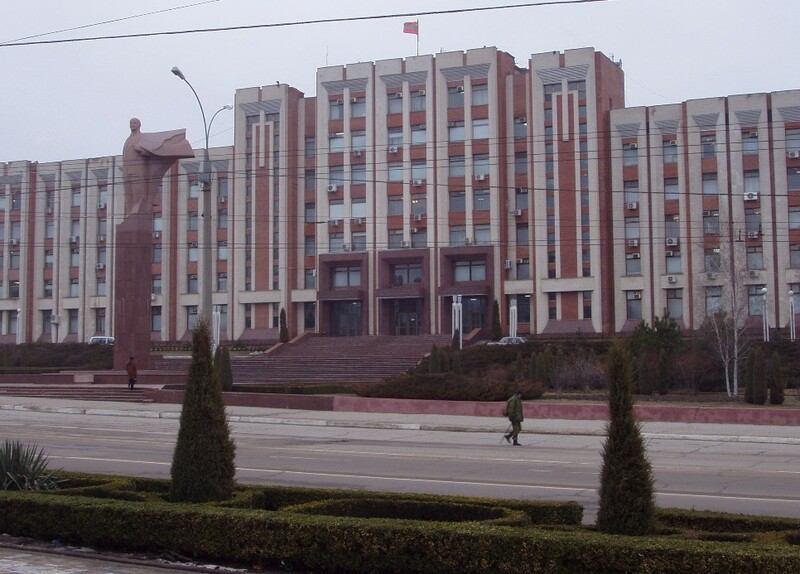 I recently spent a day in Transnistria as part of a small delegation of Americans invited to lecture at the state university in Tiraspol, the capital of this non-existent country. Not many Americans visit Transnistria, and I wouldn’t have felt comfortable making the trip on my own. As we sat in our van at the border crossing waiting for Transnistrian officials to give us the go-ahead to enter, I pulled out my camera, hoping to get a picture of the red-and-green-striped Transnistrian flag. 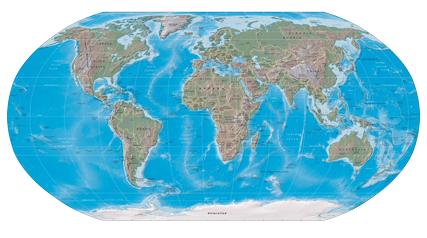 It’s not a flag you’ll typically see pictured in an atlas. An official seated next to me from the U.S. Embassy in Moldova suggested that it wasn’t such a good idea. Several months ago, another American visitor also wanted to take a picture. Transnistrian border guards are notoriously camera-shy. They fired shots in the air until she relinquished her camera. I put mine back into my pocket. As we drove through the streets of Tiraspol, I could see why travel books describe it as a living museum of the old Soviet Union. 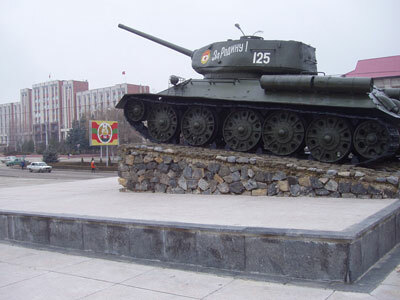 There were political billboards with the hammer and sickle, huge statues of Lenin and Soviet armored tanks on display. At the university, I gave a lecture to a group of 60 students about America’s mass media. With the help of a Russian translator, I discussed the vital role a free press plays in our democracy. I got a lot of blank looks. Under Smirnov’s iron rule, there is no such thing as a free press and people who voice dissenting opinions sometimes end up in jail. A camera crew for the state-run television station shot footage of my lecture for use on the evening news and interviewed students about their impressions. Apparently, it’s news in Transnistria when a group of Americans comes for a visit. After my lecture, our delegation dined with the university’s rector. Over borscht and cognac, he told us the rest of the world had turned its back on Transnistria. Our group listened politely. But I had other things on my mind. I wanted to go to a post office to buy highly sought-after Transnistrian postage stamps for my father, an avid stamp collector. Others in our group wanted to buy Transnistrian-made cognac, considered quite good and an amazing bargain. A couple of hours later, stamps and cognac in tow, our group crossed the border back into Moldova. There have been on-again, off-again talks about resolving the Transnistrian conflict and possibly reuniting it with the rest of Moldova. Even the United States government has gotten involved. But tensions in the region have escalated in recent weeks due to new customs rules imposed by neighboring Ukraine designed to halt the heavy flow of smuggled goods coming out of Transnistria. Smirnov has asked Russia to send more troops. In the meantime, Transnistria remains a curious relic of Soviet times and an interesting place to visit for adventurous travelers who like to go about as far off the beaten path as you can get. 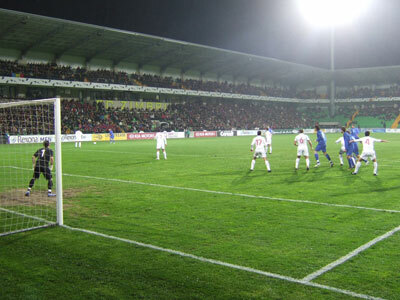 CHISINAU, Moldova –On a cold and rainy Saturday night, I arrived at Zimbru Stadium more than an hour before the start of a EURO 2008 qualifying game between the national soccer teams of Moldova and Malta. I wanted plenty of time to check out the capital city’s newest and swankiest sporting venue, which was christened less than a year ago. As I walked around the perimeter of the 11,000-seat facility, I noticed something was missing. There was no parking lot. 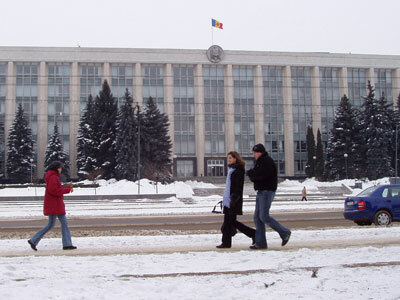 Moldova is one of Europe’s poorest countries and the average salary is about $100 a month. Few people can afford their own cars. So most of the soccer fans arrived at the stadium the same way I did – by bus. A parking lot would have been wasted space. I also noticed another difference as I priced items for sale at the concession stands. A 16-ounce cup of beer cost only 13 Moldovan lei (about $1). A bag of peanuts cost about a quarter. Prices weren’t much higher than what you would pay at any supermarket in town. Moldova, which used to be a part of the Soviet Union, has been an independent country for only 16 years. Apparently, Moldovans still have a lot to learn about something American stadiums have been excelling at for decades – price-gouging. I headed to my seat. The stadium was starting to fill and the teams were warming up on the field. It was almost dark but they still hadn’t turned on the stadium lights. The players clustered into one of the corners of the field, where there was a bit of light streaming in from the concourse. They could barely see what they were doing. Budgets are tight in Moldova and it’s not cheap to power stadium lights. Turning them on before the game actually starts is considered an unnecessary luxury. Finally, it was game time. The lights came on and the public address announcer greeted the crowd, first in Romanian, Moldova’s native language, and then in English. “Good evening ladies and gentlemens,” he said. Okay, his English needed some work, but it was nice of him to make the effort. Eastern Europeans tend to be reserved, even a bit stoic at times, and I expected the crowd of about 10,000 fans to sit on their hands and show little emotion. Boy, was I wrong. The crowd was enthusiastic and loud from the opening kickoff, chanting “hai (go) Moldova,” waving flags and erupting anytime Moldova threatened to score. They also tried the wave, but like the announcer’s English, they could use some more practice. A group of seven young men even spent the whole game without their shirts on, baring the 40-degree temperatures to proudly display painted chests spelling M-O-L-D-O-V-A. Moldova isn’t exactly a soccer powerhouse and its fans don’t have unrealistic expectations. When the team scored a late goal to earn a 1-1 tie, I never thought 10,000 people could make so much noise. I found myself yelling along with everyone else. Moldova is the quintessential lovable underdog. Its economy is in bad shape and without much money, it’s difficult to field competitive sports teams. The budget to build Zimbru Stadium was only $11 million, well less than Randy Johnson will earn to pitch for the Diamondbacks this season. But the people – like the national soccer team – work hard for little compensation and seldom complain about it. CHISINAU, Moldova – I had just delivered a guest lecture at a university located on the outskirts of Chisinau and needed to get back to the city center where I live. My faculty host pointed me in the direction of a large white mini-van pulling up at the curb with a No. 127 placard in the windshield. 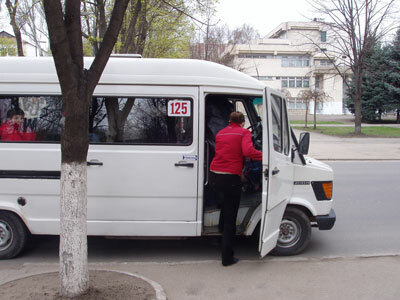 are the most common way Moldovans get around. With an average monthly salary of less than $100, few people can afford their own car. Taxis, while cheap by American standards, are also too pricey for many Moldovans. Maxi-taxis drive along designated routes throughout the city. They’ll stop anywhere along the route to pick passengers up and drop them off. You signal for one just like you’d hail a taxi. The trip started out pleasantly enough. As I climbed aboard, I handed the driver the fare of two Moldovan lei – a whopping 15 cents. There were only a handful of other passengers and I claimed a seat toward the front. Some sort of Russian disco music was blaring from the radio and every time the van hit one of the many potholes on the road, it felt like the tires would fall off. A few blocks later a woman standing on the side of the road raised her hand and the driver screeched the van to a halt. She opened the door and jumped in. A minute later several more people got in, including an elderly woman. Feeling chivalrous, I relinquished my seat. I was now standing in the aisle, holding onto a handrail above. The van stopped again. This time, five more people got in. The driver said something in Romanian, which I couldn’t understand, but judging from the actions of the other passengers, he must have instructed us to squeeze toward the back. It was suddenly getting very crowded. At least, I thought, we’d start making better time, as there was no way the driver would be stopping to pick up any more passengers. I thought wrong. There were more stops and more passengers. My personal space was no longer mine and I felt like I could barely breathe. 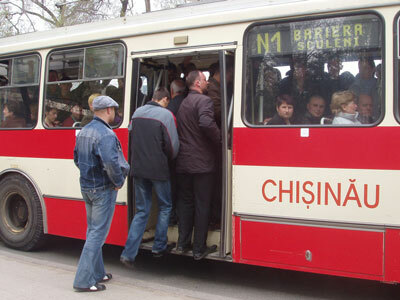 Mass transit in Moldova is a claustrophobic’s worst nightmare. Each time the driver would slam on the brakes, our small sea of humanity would move forward in unison and then back again. I was getting seasick. I hadn’t had so much physical contact with so many strangers since I played eighth-grade football. It reminded me why I decided not to go out for ninth-grade football. I looked around. None of the other passengers seemed to share my sense of discomfort. Some even talked nonchalantly on their cell phones. This is how Moldovans get to work or school every day and they’re used to it. I started to panic. There were so many people, I couldn’t see out the window. Had we passed the place where I needed to get off? Finally, after what seemed like an eternity but was probably more like 15 minutes, I heard someone say opriti (stop), and the driver braked. A few people exited and I was able to get my bearings. We weren’t far from home. A block later, another passenger shouted opriti and I followed him out the door. The driver hit the gas pedal even before I closed the door. I had survived my first maxi-taxi ride. In the process, I had gained a heightened respect for Moldovans. They are a hard-working people who go about their daily lives – sometimes in rather unpleasant conditions – with good humor and without complaining. As for me, the next time I need a ride, I think I’ll call a cab. MILESTII MICI, Moldova – This is my kind of town. There are 34 miles of streets, yet virtually no traffic. Crime is non-existent. The air is clean and the temperature is a constant 56 degrees year-round. It doesn’t rain or snow.And it’s never hard to find a good meal and a fine bottle of wine.In fact, Milestii Mici, an underground complex less than 10 miles from Moldova’s capital city of Chisinau, houses one of the largest wine cellars in the world. 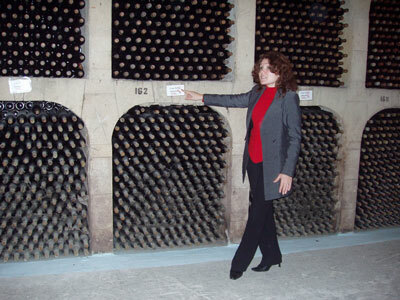 More than 1.5 million bottles and 1,300 huge oak barrels of wine dating back to the late 1960s are stored 50 yards below ground in this self-dubbed “wine town.” The site, which used to be a limestone mining operation, is now one of Moldova’s most popular tourist attractions. For about $30, you get a guided tour by car along narrow streets appropriately named Cabernet, Chardonnay and Pinot. The tour includes lunch and a chance to sample six different wines. They even give you a couple of bottles to take home. I’ve visited California’s Napa Valley before but nothing there comes close to matching the sheer magnitude of Milestii Mici. Street after street is lined with barrels and bottles from floor to ceiling. If your car is going to break down or run out of gas, I can’t think of a better place to wait for the tow truck. It’s not just about quantity, either. The winery is also proud of its quality. As we sipped several vintages of whites, reds and sparkling wine, Lily, our tour guide, told us of the numerous international medals Milestii Mici has won in various competitions. The winery’s reputation is so good, she said, England’s Queen Elizabeth and the royal family consume its red wine. Moldova, which is about the same size as Maryland, is the seventh-largest wine-producing nation in the world. Wine exports constitute about one-third of the country’s GDP. 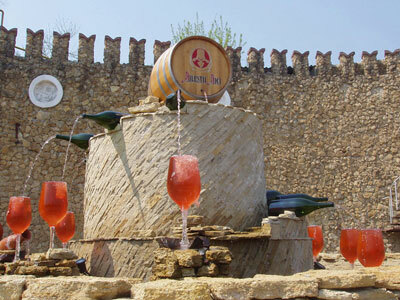 Winemaking is not only a cornerstone of the Moldovan economy, but an integral part of its culture. Many Moldovans make their own wine at home and in some rural villages, a person’s reputation is tied to the quality of their wine. But Milestii Mici and other Moldovan wineries are now facing a serious challenge. A geopolitical wine war has erupted in Eastern Europe and Moldova is in danger of becoming its biggest casualty. Until recently, 80 percent of Moldovan wine exports were sold to Russia. However, in late March, Russia announced that it would no longer buy wine from Moldova and Georgia, both former Soviet republics. The official reason given by the Russian government was that wine from the two countries is unsafe to drink. A government official cited laboratory tests that reportedly found traces of DDT and heavy metals in the wine. That’s the official reason. 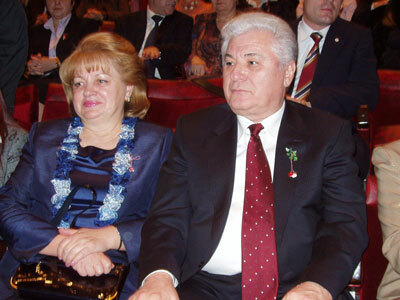 But to many Moldovans, it all smells like sour grapes. Since becoming independent from the Soviet Union 15 years ago, both Moldova and Georgia have increasingly been turning toward the West. Many view the wine ban as a Russian attempt to strong-arm the two countries back into a more submissive role. Indeed, Russia has refused to publicly release its laboratory results and independent tests of Moldovan and Georgian wine have found no problems. Further fueling Moldova’s cynicism about the embargo is that the Kremlin hasn’t banned wines from Transnistria, a mostly Russian-speaking separatist region in Moldova. Russian troops have kept the region’s rogue government in power since a civil war 14 years ago. At Milestii Mici, the ban is already taking a toll. Sales have slowed and workers have been given unpaid vacations. Other wineries have been forced to shut down completely. Meanwhile, the country is desperately looking for new markets. Moldova’s president recently visited Beijing in hopes of increasing wine exports to China. The United States is another potentially lucrative market. Moldovan wine is already sold in 25 states. The hope is that American consumers will find Moldovan wine to be a good-tasting alternative to pricier French and Italian products. Lily, our Milestii Mici guide, is optimistic Moldova’s wine industry will withstand the Russian embargo.